From there we will roll across the city to destinations well suited for creating musical bike magic. 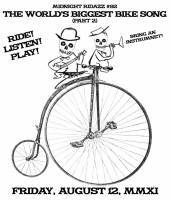 Bring any instrument you can play while riding your bike. ie' bell, horn, squeeky bottom bracket or vox. can ride your bike can play it safely ... then great! if not, there is always red lights. - Mellow pace. Think about the people behind you not the people speeding off the front. you... we'll see you when we get there. your air pressure and fill your tires, especially if you are riding a cruiser, mountain bike, or foldie. The ride's music will have two major components. Our improvised jam sessions while we ride. And various performances when we stop. voice / singing / rapping / beat box / ??? (If you come empty handed, no problem, we all have voices). If you want to help this ride be great and keep the Midnight Ridazz mothership of love going strong.